A major coal company had plans to save one of the West's largest coal plants from closing. It just needed help from the Trump administration. So in September 2017, Peabody Energy Corp. sent the Interior Department a game plan for keeping the 2,100-megawatt coal-burning behemoth in Arizona rumbling. The company's mine supplies coal to the plant. Included on the coal company's wish list was eliminating environmental requirements for reducing haze. Peabody also asked the government to push the plant's largest customer to continue buying its electricity instead of renewable energy. Together, that could help prevent the plant from shuttering years ahead of schedule, the company told administration officials. It seemed to find supporters in Washington, D.C.
"I think these are reasonable requests that don't put us at risk," Scott J. Cameron, Interior's principal deputy assistant secretary for policy, management and budget, wrote in a September email to his boss, Assistant Deputy Secretary James Cason. That email and other documents were obtained by E&E News through a Freedom of Information Act request to the Interior Department. They illustrate how closely federal officials cooperated with Peabody to save the Navajo Generating Station (NGS). The power plant, which sits on a high desert plateau on Navajo lands near the mouth of the Grand Canyon in northern Arizona, has emerged as a symbol of the Trump administration's promise to revive the coal industry. It was originally scheduled to run until 2044. Then, last year, four utilities with an ownership stake in the facility voted to shut it down at the end of 2019, citing competition from natural gas (Climatewire, Feb. 14, 2017). The plant's fate might have been sealed if not for the federal government. The Bureau of Reclamation owns a 24 percent share in the plant, and Interior Secretary Ryan Zinke has made personal appeals to keep it open (Climatewire, April 13, 2017). Federal officials soon threw their weight behind Peabody's requests. The email from Cameron to Cason, on Sept. 11, 2017, included a 12-item list under the heading "NGS-Related asks of DOI from Peabody and Lazard," the coal company's consulting firm. Two items concerned the Central Arizona Water Conservation District (CAWCD), the power plant's single largest customer. The water district was readying a plan to reduce its reliance on NGS and buy more renewable energy. Peabody asked Interior to press the water district to continue buying the plant's power instead of ramping up its renewable energy use. Interior did just that. In June, Assistant Secretary for Water and Science Tim Petty wrote to the water district, saying it was legally obligated to buy NGS power (Greenwire, June 5). The argument closely mirrored Peabody's request. The administration and Peabody contend that Congress intended the water district to buy NGS electricity when it signed off in 1968 on the creation of the aqueduct system, which delivers water from the Colorado River to Phoenix and Tucson. NGS has long powered the pumps that move the water across the desert. When an Interior spokeswoman was asked whether Petty wrote the letter at Peabody's behest, she responded "no" and did not elaborate. She did offer comment about Interior's general involvement in the dispute. "The parties need to work out a mutually acceptable arrangement, and that would require them to work with Peabody in their interest pertaining to the mine," said spokeswoman Faith Vander Voort. The water district, which says it can get cheaper power from other sources, ignored Interior's warning and signed the renewable contract (Climatewire, June 8). The disagreement will now be decided in court after Peabody sued the water district over its electricity contracts (Climatewire, May 2). Peabody asked Interior to weigh in with other federal agencies. In one instance, it asked Interior to reach out to EPA about eliminating a requirement to install $1.1 billion in environmental controls to limit emissions of nitrogen oxides (NOx), primary components of haze. "This requirement is a significant obstacle for new ownership," Ray Shepherd, a Peabody executive, wrote to Cameron on Sept. 1. Former EPA Administrator Scott Pruitt weighed in a month later in a letter to George Bilicic, a Lazard Frères & Co. LLC consultant working on behalf of Peabody. A new owner would not be subject to the environmental controls called for by the plant's existing air quality permit, Pruitt wrote, provided that the facility did not violate its NOx emissions cap. In his email to Cameron, Shepherd acknowledged the difficulty in finding a new owner for NGS. "One thing is for sure, we need an extraordinarily high level of alignment and collaboration between Navajo Nation, the U.S. Government, Peabody and the state of Arizona," he said. "If these parties can't come together in a spirit of cooperation, determination and fairness, NGS will not operate beyond 2019." Peabody, the largest publicly traded coal company in America, has used a full-court lobbying press to save the plant. It hired a consultant to find a new plant owner while pushing state and federal lawmakers to pass measures designed to keep the plant open. The St. Louis-based company has a lot to lose if the generating station closes. The coal company operates the Kayenta mine on Navajo and Hopi lands. The power plant is the mine's only customer. Kayenta accounted for almost 4 percent of Peabody's U.S. coal production in 2017, according to company documents. 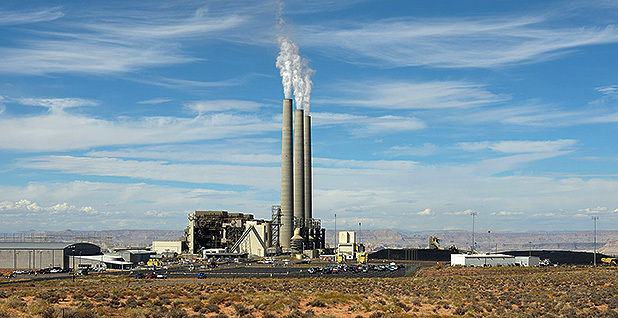 Peabody has criticized the utilities' decision to close the plant, saying its retirement would leave Arizona overly reliant on natural gas and jeopardize the future of the CAWCD. It also says that shuttering the plant could destroy the Navajo and Hopi economies, which are heavily intertwined with coal mining. A Peabody spokeswoman said the emails showed the attempts of its consultants to gather information about the plant's operations as they prepared to market the facility to perspective buyers. "We support all appropriate steps to facilitate the transition of the plant to new ownership," said Charlene Murdock, the Peabody spokeswoman. "NGS is vital for energy security, water delivery, and Hopi and Navajo economies, and we are encouraged that potential new owners have determined they can continue to serve customers cost-effectively well beyond 2019." The outcomes of other Peabody requests were more difficult to discern. Company executive Shepherd wrote in his email to Cameron, the Interior official, that closing NGS would be "premature." He seemed to reference the Energy Department's effort to implement a plan to subsidize coal plants that store fuel on-site. DOE should advance the idea of grid reliability and "specifically support NGS as a premature baseload retirement that should be avoided," Shepherd wrote. DOE's subsidy plan was rejected by the Federal Energy Regulatory Commission earlier this year. The agency has since embarked on a new rescue plan for struggling coal plants, arguing that their retirement poses a national security threat. Many of Peabody's requests focus on the Salt River Project (SRP), the Arizona plant's operator and majority owner. Peabody urged Interior officials to ask the utility not to transfer employees away from NGS, to continue maintenance and to avoid saying discouraging things about the facility to prospective buyers. The requests suggest there were tensions between the mining company and the utility. "On the cooperation point, however, importantly, we just don't see SRP as being enthusiastic about working on a successful transfer here and we otherwise think there needs to be a discipline and sense of urgency applied to the process," Bilicic, the Lazard consultant, wrote to Cameron in September. Scott Harelson, an SRP spokesman, said the utility remains willing to work with a potential buyer. But absent an agreement, SRP will continue with plans to decommission NGS, he said. It remains unclear whether the plant will be sold. Peabody's efforts have helped draw the interest of Middle River Power. The Illinois-based private equity company has said it's exploring plans to purchase the plant and recently announced that it was negotiating with the Navajo Nation over a potential lease. While Navajo leadership is supportive of efforts to keep the plant open, potential sticking points abound. Much of Peabody's game plan for keeping the plant open focuses on reducing costs. But it is unclear whether the Navajo would agree to lower lease payments that might be needed to reduce its operating costs. "Any deal where we get a lower lease payment, it's probably not going to work," said Jackson Brossy, who leads the Navajo Nation's Washington office. "The Navajo president is looking out for the Navajo people now and for 50 years." SRP, meanwhile, has begun taking steps to wind the plant down. Ninety-three plant employees have accepted transfers to other SRP facilities, and the utility has halted long-term maintenance projects, Harelson said. Whether the federal government has enough muscle to keep the plant running remains an open question.